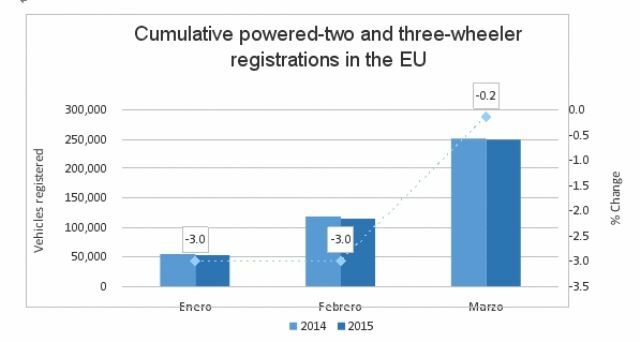 Some 250,080 powered-two and three-wheelers were registered during the first three months of 2015 in the European Union (EU), down a modest 0.2 percent compared to the 250,460 units registered during the same period of 2014, according to the Association of Motorcycle Manufacturers in Europe or ACEM. Registrations grew in Spain (27,920 units, up 18.11 percent year-on-year or YoY), the UK (25,394 units, up 11.8 percent), and Germany (47,590 units, up 0.2 percent), but dropped in Italy (40,660 units, down 4.6 percent YoY) and France (49,260 units, down 6.2 percent YoY). Cumulative motorcycle registrations grew by 4 percent during the first three months of 2015 on a YoY basis. 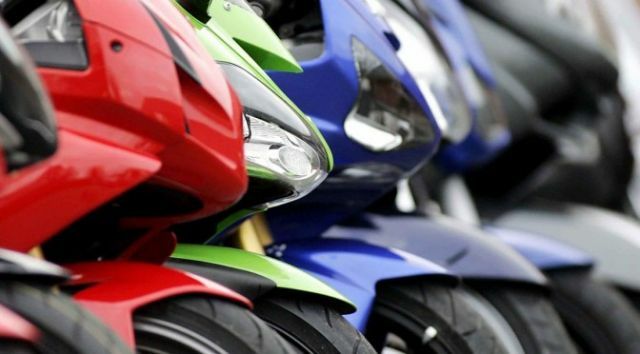 A total of 189,570 motorcycles were registered in January and February 2015, against 182,270 a year earlier. YoY motorcycle registrations increased in key European markets including Spain (24,700 units, up 19.1 percent), the UK (23,465 units, up 14.3 percent) and Germany (40,050 units, up 3.8 percent), but decreased in Italy (35,810 units, down 1.5 percent) and France (33,475 units, down 3.6 percent). A total of 60,510 mopeds (with sub-50c.c. engine displacements) were registered during the first three months of 2015 in the EU, compared to 68,180 mopeds registered during the same period of 2014, representing a decrease of 11.3 percent. Registrations increased in Spain (3,220, up 11.4 percent), although they decreased in France (15,790 units, down 11.1 percent), UK (1,930 units, down 11.9 percent), Germany (7,540 units, down 15.5 percent) and Italy (4,850 units, down 22.4 percent). Another vehicle that has been driving PTW sales in the EU, albeit less obvious now, is electric models. 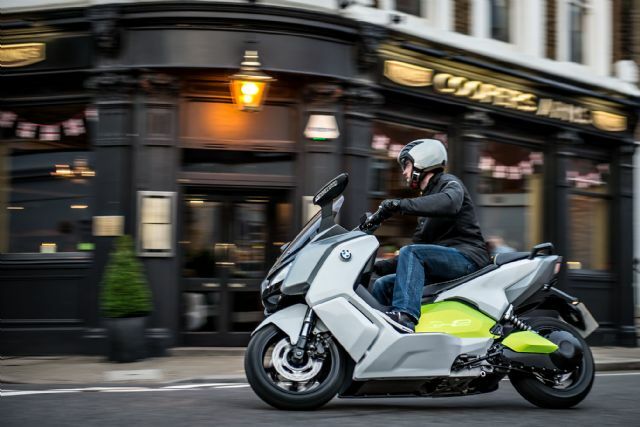 One reason helping to facilitate sales of electric motorcycles and scooters is that such vehicles now qualify for governmental subsidy in the U.K., under plans announced by the Office for Low Emission Vehicles (OLEV). A pool of up to 7.5 million euro will be made available from summer 2015 throughout 2020 and capped at 1,500 euro per vehicle. The U.K. government subsidy makes qualified vehicles up to 20 percent cheaper, establishing PTWs as the most affordable electric vehicles (EVs) on the market to be within the reach of people on lower incomes. Electric PTW will help cut CO2 emissions but there are wider benefits too. Research shows PTWs help reduce congestion for all road users, ACEM says. Such environmentally-friendly PTWs also take up far less space to park, expanding available parking in city centers and workplace. Riders benefit from shorter journey times as they can use bus lanes in many towns and cities and weave through queues of traffic. These vehicles are economical to run and are exempt from the Congestion Charge and Work Place Parking Levy in the U.K. The U.K. Government will continue to work closely with the industry as it finalizes the details of the scheme, including the grant level and final eligibility criteria, but it could be up and running in dealerships as early as this summer. Steve Kenward, CEO of the Motorcycle Industry Association (MCIA), whose members are manufacturers and importers of PTWs and the suppliers of associated goods and services in the U.K., says this news bodes well for both industry and the U.K.'s clogged roads: "This is significant development as it recognizes the part motorcycles and scooters can play in a low carbon future. The Subsidy will encourage more people to opt for electric motorcycles and scooters, which will help solve the U.K.'s appalling congestion problem. Economically, it will provide a much needed boost to this sector of the automotive industry. We hope this will result in increased investment in British research and development for electric PTWs, and hope it will give manufacturers who already have electric models for sale in mainland Europe the confidence to launch in the U.K."
The U.K. Business Minister Matthew Hancock said: "Low emission vehicles are the future and show that we can meet our climate change commitments without giving up cars or motorbikes. Electric motorcycles and scooters have got fantastic potential and can be a real force for good. This investment shows we are serious about increasing the uptake of cleaner vehicles in the U.K. to offer a fantastic place for firms to locate R&D and manufacturing facilities. Supporting new technologies is a key part of our long-term economic plan."